Be the first to share your favorite memory, photo or story of Linda . This memorial page is dedicated for family, friends and future generations to celebrate the life of their loved one. 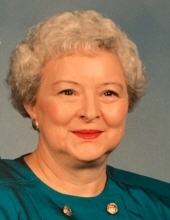 Westminster – Linda Ann Grant Murray, 78, beloved wife of late James (J.B.) Bruce Murray, of 511 Williams Farm Road, passed away November 30, 2018, at Clemson Downs Health Care. Born in Oconee County to the late Albert W. Grant and Isabelle Bice Grant. Mrs. Murray was retired from Clemson University as an Executive Administrative Assistant at the Alumni Center after 34 years of service. She is survived by her daughters, Sandra A Murray and Mary Blackburn of Duluth, Georgia, brother, Richard Grant of Oakway; and sisters, Clara Grant Blackwell of the Oakway Community, Bonnie Grant McAlister of Oakway, SC, Nellie Grace Grant Durham, of Oakway, SC, one grandson, Andy Greenway, and numerous nieces, nephews, and their children. She was preceded in death by her parents, her husband and sisters, Betty Ruth Grant and Mary Grant Carter. A funeral service will be held at 2:30 pm, Sunday, December 2nd, 2018, at Sandifer Funeral Home. The family will receive friends 12:30 -2:00 pm, on Sunday, December 2nd, 2018, at the Sandifer Funeral Home. Burial will follow at Oakway Wesleyan Church Cemetery. Flowers are accepted or memorials may be made in Linda’s memory to American Cancer Society, PO Box 22718, Oklahoma City, OK 73123 -5216, your choice of Clemson University Scholarship Funds, Oconee County Animal Shelter, P.O. Box 966, West Union, SC 29696, or the Fair Oak Center, P.O Box 212 Fair Play, SC 29643. Condolences may be expressed online by visiting www.sandiferfuneralhome.com. To send flowers or a remembrance gift to the family of Linda Ann Grant Murray, please visit our Tribute Store. "Email Address" would like to share the life celebration of Linda Ann Grant Murray. Click on the "link" to go to share a favorite memory or leave a condolence message for the family.